Kyle graduated from Castleton University with a Bachelor’s Degree in Exercise Science. While at school, Kyle worked in a wide range of classes during his studies at Castleton; everything from anatomy and physiology to nutrition and strength training. He was also a member of the Varsity Cross Country team and continues to include distance running with his strength and sprint workouts. Kyle completed a marathon recently, and is thinking about competing in another soon! Along with his Bachelor’s Degree in Exercise Science, Kyle is a certified Personal Trainer through the Aerobics and Fitness Association of America (AFAA). 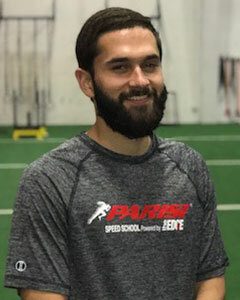 He is now a Personal Trainer at The Edge in Williston as well as a Performance Coach for the Parisi Speed School. Kyle loves to work with individuals of all ages, creating healthy habits and accomplishing goals with children and adults alike. His specialties include strength and form training for runners, working with seniors, strength and movement mechanics for children, and overall fitness & lifestyle changes for individuals of all ages!